James Vanderbilt directorial debut was really a showcase for Cate Blanchett more than anything or anybody else. 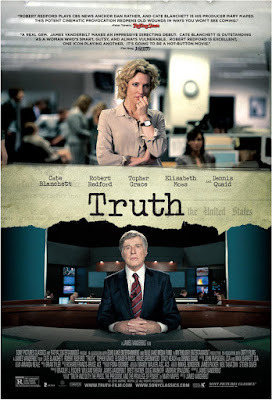 Blanchett gave another fantastic performance as Mary Mapes as we followed her through the highs and lows as she investigated and reported on the Killian Documents. Unlike Spotlight which was a true ensemble performance, the rest of the cast: Robert Redford, Elizabeth Moss, Topher Grace and Dennis Quaid truly were there to support Mapes/Blanchett. Vanderbilt's story and pacing meandered a bit here and there, and the focus always seemed a bit muddy - The Truth? Journalism? Dan Rather? Mary Mapes? Corporate greed? Nonetheless, it was a pity that Blanchett was overlooked at last year's Oscar for another astonishing work!